Check out a full list of Chase's races on our "Schedule" page. See when he will be closest to you or when his next race is. Visit our online store for everything CJR. T-Shirts, Hoodies, Stickers, Memrobilia and Autograph Cards. Take a moment and check out all of the companies who support Chase. Support those that support us! 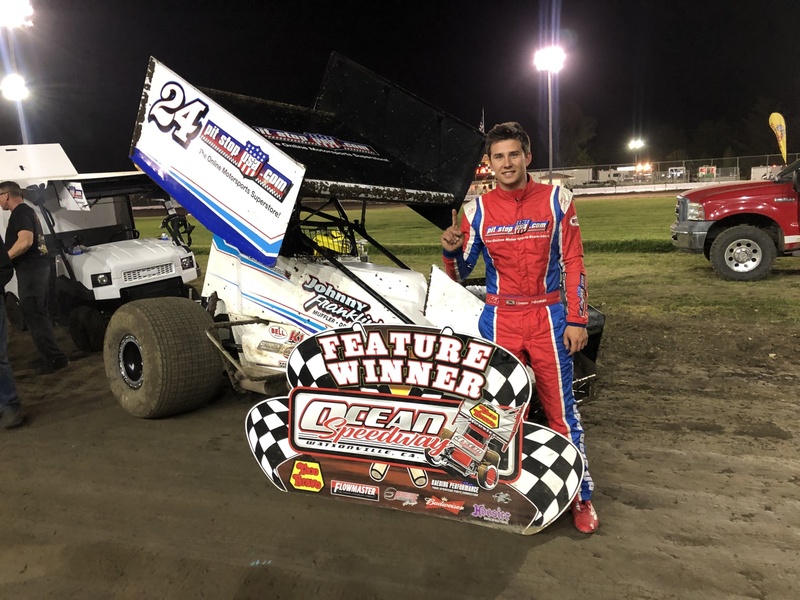 Inside Line Promotions - WATSONVILLE, Calif. (April 15, 2019) - Chase Johnson was victorious in his third different type of race car last Friday at Ocean Speedway, where he captured his first winged sprint car triumph of the season in his family owned No. 24. "That's something really special," he said. "That's a big goal of mine this season and is for my future. I want to show up to the race track and I want to be capable of winning in any type of car at any type of track. It's cool to get three different types of wins this early in the season. Now we need a winged 410 win and non-wing 410 win and I'll be a happy camper." Johnson, who posted a midget and a 360ci non-wing sprint car victory last month, kicked off Friday's competition by qualifying fourth quickest. He then advanced from third to second place in a heat race and from fourth to third place in the dash to line up on the inside of the second row for the main event. "We qualified good," he said. "It wasn't setting the world on fire, but we were good enough to be in a good spot. We took what we could each time we hit the track and that put ourselves in a good spot for the main. "I got to second on the first lap and I want to say we grabbed the lead on the second or third lap. I felt really good. We have a strong engine package and a strong car package. I feel really strong whenever we hop in that car. I feel like it's capable of winning any time we hit the track." That was evident on Friday as Johnson led the majority of the laps after taking the early lead and he outlasted his younger brother, Colby, for the trip to Victory Lane. "Our team had a one-two finish so that was pretty cool," Chase Johnson said. "That is the first time that's happened so it was really special to go first and second. It was pretty much a perfect night for our family and our team." Next up for Johnson is the season opener at Petaluma Speedway in Petaluma, Calif., this Saturday. April 12 - Ocean Speedway in Watsonville, Calif. - Qualifying: 4; Heat race: 2 (3); Dash: 3 (4); Feature: 1 (3). Saturday at Petaluma Speedway in Petaluma, Calif.
Johnson has new t-shirts and hoodies for sale at his race trailer at every race he competes in this season. T-shirts are $25 each and hoodies are $35 apiece. With California locations in Santa Rosa and San Rafael, Johnny Franklin's Mufflers has been a leader in the service industry for mufflers, drivelines and hitches for more than 50 years. "Johnny Franklin's Muffler has been with me since Day 1 of my racing career," Johnson said. "With their two locations in both Sonoma and Marin County's makes for no excuse to not stop by and get a free quote on making your street car sound like my race car. Family own and ran since 1961, you feel the family atmosphere instantly. For not only your exhaust and muffler needs, Johnny Franklin's also can take care of your driveline and hitch issues. Visit them today and tell them I sent you." Johnson would also like to thank Fire Suppression Engineering, Newman Freeman Racing, PitStopUSA.com, Flowmaster, Woodland Napa Auto Parts, VanLare Steering Repair, Wesmar Racing Engines, Wings Unlimited, Schoenfeld Headers, Bell Helmets, LRB Race Products, Champion Machine, Swift Metal Finishing and Chevron Pro-Gas for their continued support. To meet the media relations needs of your program by joining Team ILP, contact Shawn at 541-510-3663 [email protected] . For more information on Inside Line Promotions, visithttp://www.InsideLinePromotions.com.